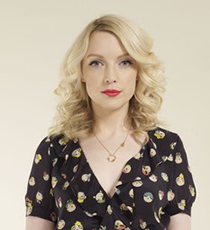 Lauren Laverne is a multi-award winning broadcaster with twenty years’ experience working in broadcasting and the music industry. She has hosted on every major British television network and on BBC Radios 1,2,3,4,5 Live and 6Music, where she currently hosts the morning show and where she has been instrumental in making the station the UK’s most-listened to digital station in the recent rajars, with 2.4M listeners. Lauren began her career in music. As a teenager a record deal for her band Kenickie brought her to London. Guest spots on shows like Never Mind the Buzzcocks brought offers of television work on music shows (everything from the BBC’s Glastonbury coverage to CD:UK and MTV). She then discovered her passion for radio via a highly acclaimed stint as a DJ for leading London radio station XFM. This was followed by a move to BBC 6Music, where she now hosts a daily show with over 1 million listeners. She also presents on BBC Radio 4, both as a documentary maker and as part of the team on the iconic Woman’s Hour (she is also the host of the monthly Late Night Woman’s Hour special intended to introduced the programme to a new, millennial audience). Laverne’s successful and varied career includes a specialism in presenting live – on radio, at events. She has hosted The Mercury Prize, The Turner Prize and The British Fashion Awards numerous times. On television she has presented a diverse range of arts and culture shows from BBC 2’s Glastonbury coverage (which Laverne has presented since 2002) to BBC 1’s Film 2017. She hosted Channel 4 music show Transmission, BBC 2’s The Culture Show and Channel 4’s satirical news programme 10 o’Clock Live for several seasons. She is a regular host of world premieres in London’s Leicester Square, working at the London Film Festival for over half a decade. In 2010 Lauren published her first book: Candy Pop: Candy and the Broken Biscuits. She has also written regular columns for The Observer, Red and Grazia magazines. Company: Sassy Films for E!